The next step in the process was to decide how I wanted to use this new fabric. I searched my Pinterest page for some inspiration. I also reviewed some of the classes that I have taught, since it would be easy to recreate something that you have all ready had success with. I decided that I would use the t-shirt to create a jacket similar to one that I had previously taught using a sweat shirt as a base. This is the sample from my sweatshirt/jacket class. Instead of using a sweat shirt, I decided to create a quilted piece of fabric using the front and the back of the T-shirt. Having worked with T-shirts and quilts, I knew that I needed to back the T-shirt pieces with a stabilizer before cutting them up. So I fused No Show Mesh stabilizer by Floriani, to the back or wrong side of each of the T-shirt pieces. I like to use No Show Mesh because it prevents the fabric from stretching out of shape, but allows the T-shirt to follow the shape of the quilting and not be ridged. Next I straightened the edges of the pieces and decided what I wanted to do to increase the size of the T-shirt fabrics. I would need to increase the size of the piece to allow enough ease since the quilted fabric would respond like a woven instead of a knit fabric. I decided to use the peacock fabric in a color block manner that would appear on the sides of the jacket. I also used the same fabric as a yoke on the top of each piece. In addition, I pieced some 4-patch blocks to increase the width of the back piece. Then I created a quilt sandwich and free-motion quilted the front piece. 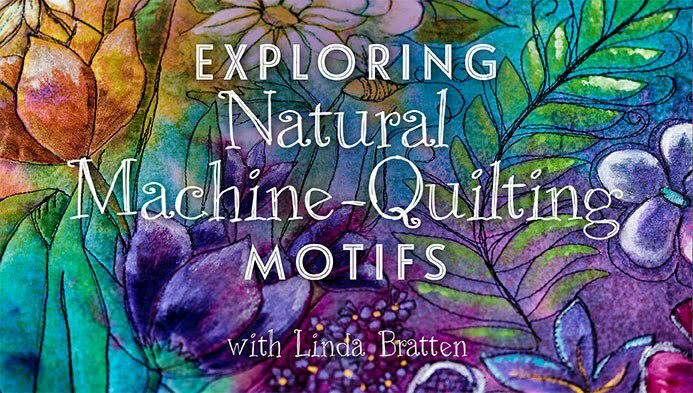 I used many of my Exploring Natural Machine-Quilting Motifs from the Craftsy class that I teach. Can you identify any? Using my Nature Inspired Quilting Motifs to create new fabric! Keeping an eye on the clock I knew that I was also challenged by the deadline. So I examined what remained to be done and the remaining amount of time. At this point, I decided that I needed to change to a project that could be completed in a shorter amount of time using what I had all ready completed. So I scoped out my studio, and found a great peacock zipper. This inspired me to decided to create a zippered pouch! Something that I could complete in the remaining time. So I squared up my quilted piece, and got my serger ready to go! is decorative, I am planning to showcase it by sewing an exposed zipper in the bag. Thus I serged both top edges of the bag to finish off the raw edges. The serged top edge of the bag. Next I went to my sewing machine to attach the zipper. I created end pieces for the zipper by taking a piece of fabric 2" x the width of the zipper. I pressed the fabric in half so it measured 1" x width of zipper. Then I pressed the raw edges to meet at the center fold. I then put the stop end of the zipper in to the end piece and stitch the open end closed. Measure the edge of the bag that the zipper will go on, and trim the zipper 1" less than that measurement. Then sew the other end piece on the other end of the zipper. Next place the outside edge of the zipper on the edge of the serger stitches. Sew the zipper on one side of the bag. To make this easier unzip the zipper and sew down a portion of the zipper. Then insert the needle into the zipper and lift the presser foot. Zip up the zipper, pulling the zipper pull behind the presser foot. Lower the presser foot and continue stitching the zipper to the top of the bag. Stitching the zipper on the right side of the bag's edge. Pull the zipper pull behind the presser foot and continue sewing. To sew the other side of the zipper you will need to bring the unsewn, right side edge under the unsewn zipper edge. This will create a tube in which the wrong side of the bag will be on the outside of the tube. Sew down the unsewn edge of the zipper to the right side of bag in the same manner as the first side. Sewing in the tube to attach the other side of the zipper. Next unzip the zipper so when we create the bag we can turn it inside out. Now with the wrong side of the bag still on the outside of the tube, place the zipper at the top and flatten the bag to find the center opposite of the zipper. Take the center and push it into the bag about 1" on each side of the center. This will create a "W" on the bottom of the bag to create depth for the bag. Looking at the edge of the bag to see the "W" to create depth. Place a pin parallel and 1" away from the raw edge to hold the "W" in place. You place the pin there so it never comes in contact with the blade of the serger. Where to place your pins when serging. Create a "W" on the other side of the center of the bag. Then turn off your serger blade. It is best not to use a blade when serging around zippers. Using the same threads and settings, serge down each side. Use a small amount of Fray Block to seal the beginning and ending stitches. Let the Fray Block dry then trim away the excess tails. Serged inside seam of the bag. Turn your bag right side out and enjoy! I plan on using mine when I travel and do presentations to carry my necessary techie supplies like tablets, hard drives, pointers and adapters. Back side of the bag. 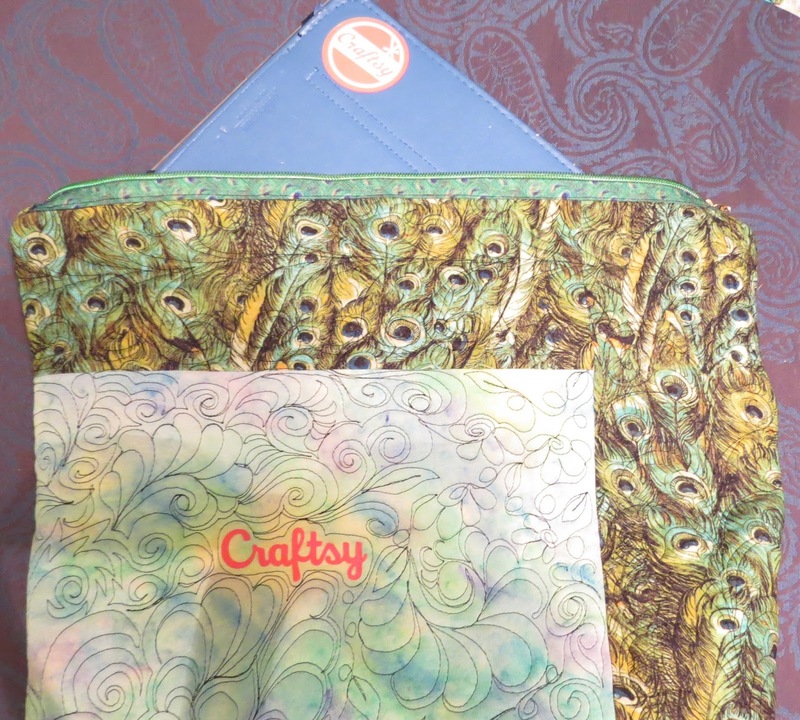 Just to let you know, I sent my photos of the completed bag in before the deadline. However, I was too tired to share the process with you here till now. Have you ever created under pressure? Or changed sewing projects to meet a deadline? I would love to hear about your sewing adventures. 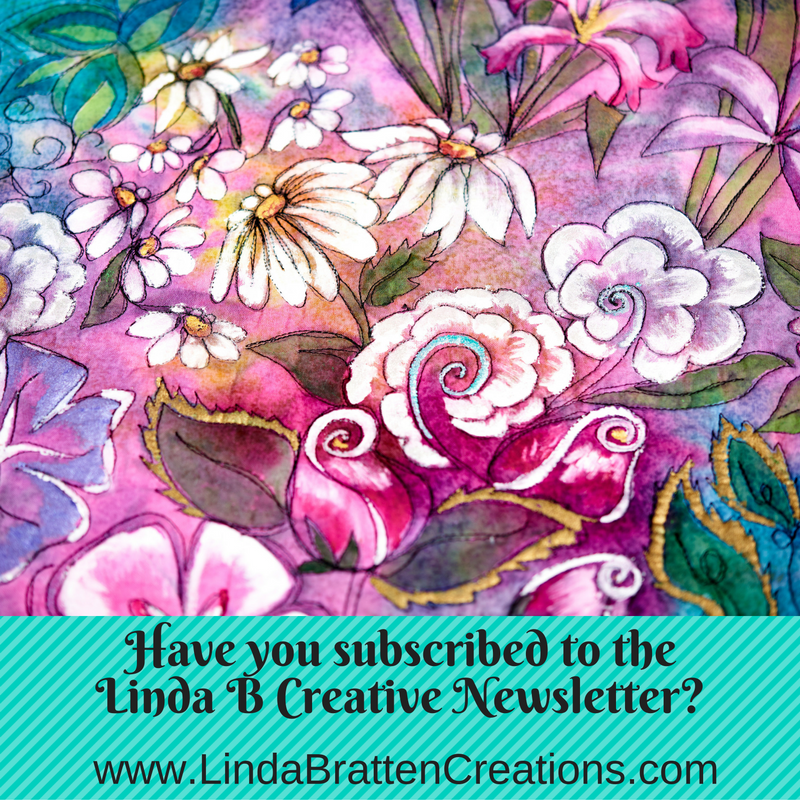 Click on the photo to sign up for my free monthy newsletter, Linda B Creative, where I share tips, patterns, and techniques to inspire your creativity! Check Out My Bluprint Class! Click on My Class Card to use my affiliate link to sign up for your favorite Bluprint classes. I am a quilt artist and instructor with a passion to explore new avenues of creativity. I author books, create patterns, and digitize machine embroidery designs through my business, Linda Bratten Creations. I am an online instructor with Bluprint. In my spare time, I am a wife, mother of three, mother-in-law of three, and grandma of three! The contents of this blog are my personal property and any use is prohibited without my permission. Simple theme. Powered by Blogger.